Feels Good In So Many Ways. Cork floors are exceptionally beautiful, naturally comfortable and remarkably warm. TORLYS are the leaders in cork flooring. Our styles feature on-trend colours, thicker and first-ever, extra-long planks. Our new, extremely durable smart finish is integrated into TORLYS Cork, making it 50% more durable than past finishes. Best of all, it’s sustainable, making it a responsible choice. Finally The Floor That Has It All. The Beauty of Wood, Durability of Laminate and the Comfort of Cork. There is nothing like the welcoming look of hardwood. TORLYS CorkWood™ is designed with style in mind, featuring on-trend colours and textures in realistic patterns of oak and walnut. It is offered in two stunning collections: CorkWood™ Designer and CorkWood™ Elite that feature long and wide planks to create a truly expansive look in any space. Torlys peace of mind assurance with 30-35 year residential warranties. Sealed edges for an increased water resistance. See full warranty details for this product. Warm to the touch with the cork top layer and CorkPlus™ attached cork underlay. State-of-the-art direct print technology, that allows the CorkWood to perform like a laminate, creating a wear layer equivalent of an AC4 rating. Cork and CorkWood have very good acoustic ratings on their own, combined with the CorkPlus™ attached underlay, this diffuses noise in rooms above and below. TORLYS High-density smart core and compressed cork top layer, ensuring it will perform for years. Spills and messes are easily wiped up with a cloth. To eliminate grime and grit, clean weekly by simply using a broom or vacuum (bristles down) and then when required use our Torlys Natural Glow Eco-friendly Cleaning Kit.Refer to Torlys Maintenance Guide for full details on caring for your floor and keeping the appearance of your floor like new. Comfortable and beautiful for all rooms in your house – depending on your lifestyle. CorkWood is engineered from cork and uses state-of-the-art direct print technology that looks like hardwood and performs like laminate. It has the equivalent of an AC4 laminate wear rating, meaning the floor performs to the same standards as high quality laminates, ensuring it will perform for years to come. The compressed cork top layer along with the CorkPlus™ attached underlay provides the floor that offers the ultimate in comfort, acoustics and warmth. When researching your preferred flooring, compare TORLYS Cork and Corkwood to those in similar categories. TORLYS Cork and CorkWood™ planks utilise the patented Uniclic® joint technology, the only floor backed by a gap warranty. Cork floors are made without cutting down any cork trees. The cork bark is carefully harvested once every 9 years, in centuries-old traditions with hand tools, ensuring that forests will remain undamaged. Torlys are dedicated to providing your family with a comfortable and hygienic flooring solution. Our products meet the Californian Section 01350 requirements, one of the most stringent indoor air quality standards in the world. Being a compressed of millions of tiny air pockets, cork is a great insulator and is quiet and comfortable underfoot. This feature helps to reduce heat loss in rooms, maintaining a pleasant indoor air temperature. 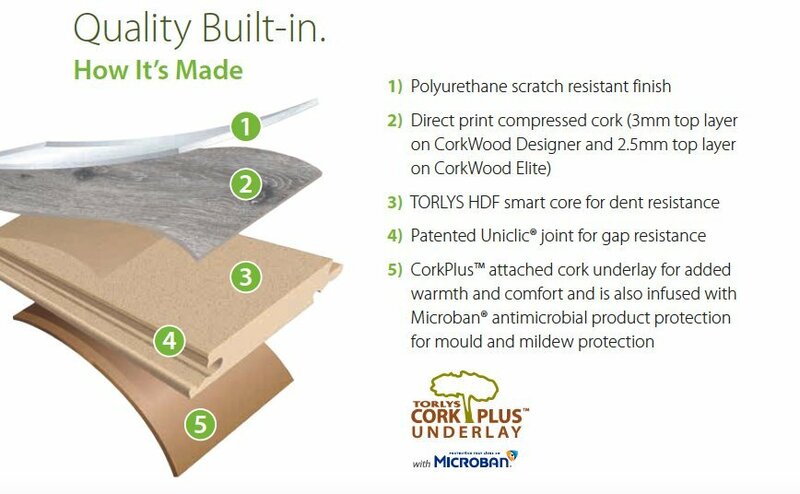 The CorkPlus™ attached underlay, made from recycled cork, adds an additional warmth and sound insulation. It is even infused with the Microban® antimicrobial product protection to inhibit the growth of mould and mildew. All Torlys cork floors are created with quality in mind. They are made with precisely engineered high-density wood smart core, which is more dent resistant than other floors. The patented Uniclic® joint technology used in all cork smart floor construction resists gaping, keeping your floors as beautiful as the day they were installed for years to come. 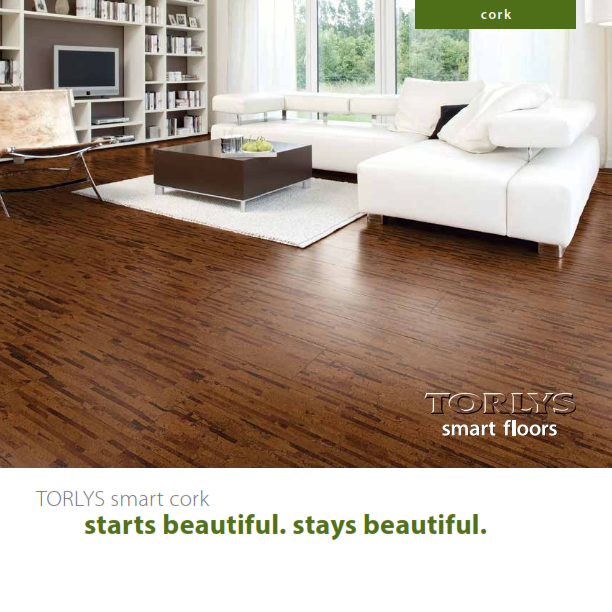 The extremely durable TORLYS smart finish has been integrated into every TORLYS cork floor. This innovative finish is the strongest, most durable and most environmentally friendly water-based urethane finish ever created. This designer-styled collection takes cork flooring to a new level, offering the longest cork plank available today. Adventurous in the most on-trend colours and textures, your design preference will be rewarded with a rustic natural look. This is handmade, scraped and layered, which gives a natural authentic finish. The Look: Trendsetting styles, endorsed by designers, in impressive wide and the longest planks. The Feel: Richly textured, comfortable and warm. The Details: 4-sided bevel-edge, premium plank flooring with attached CorkPlus™ underlay with Microban® antimicrobial treatment. Textured styling with extra tough TORLYS smart finish for durability. FSC® certified. Florence Elite is a finely crafted bevel-edged cork collection that comes in long, wide planks in a palette of oday’s must-have colours. Tasteful elegance is captured in the naturally textured styling. When you want to combine distinctive design with richness and comfort, this is the perfect choice. The Look: Richly textured, comfortable under foot and warm. The Feel: Distinctive design creates a sense of warmth and character to any space. The Details: 4-sided bevel-edge, premium plank flooring with attached CorkPlus™ underlay with Microban antimicrobial treatment. Textured styling with extra tough TORLYS smart finish for durability. FSC certified. The Look: The appeal of distinctive cork with the texture that only cork provides. The Feel: Warmth and comfort underfoot. The Details: 4-sided bevel-edge, traditional plank flooring with attached CorkPlusâ„¢ underlay with Microban‚® antimicrobial treatment. Textured styling with extra tough TORLYS smart finish for durability. FSC‚®certified. Contemporary, Sustainable, Finally the Floor that Has it All! Our most beautifully crafted collection, designed to emphasize the true essence and beauty of hardwood. CorkWood Elite brings the natural feel and beauty of wood to any space.